Turning up at a venue that actually has a queue outside is under-appreciated by many, I think. But it usually promises a great atmosphere as people only queue when they get free stuff or are really keen for something. 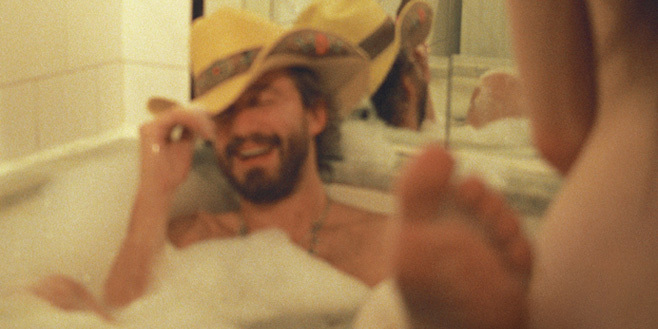 In this case it was the bargain of seeing American folk/country rock heroes Phosphorescent bring a little bit of sunshine from the Wild, Wild West into a rainy Liverpool evening. At least that seems to be where not only the main act themselves but also support group Caveman just came from. While Phosphorescent unsaddled and led their horses to the next watering hole, the Brooklyn-based five piece entertained the eager onlookers with a crossfire of folky beats, sweeping melodies and softly intermingling vocal harmonies reminiscent of Fleet Foxes. Judging by the reaction of the crowd, if Caveman came out on a headline show tomorrow, many would gladly receive it. sing-alongs, while the rest, including songs from earlier, lesser known albums, were also generally very well received. Houck himself was in perfectly good spirits and form, delivering his homemade brand of painfully truthful and well-crafted country rock with believable passion and genuine enjoyment. The band’s current line up (in which Houck is the only constant) did an extremely good job in giving ‘Song for Zula’ the haunting depth that makes it so beautiful, as well as providing all the other diverse shades of country/folk/rock/pop/etc. Phosphorescent are famed and loved for. Even without an entire band on stage, indeed equipped with just a keyboard and his voice, Matthew Houck managed to keep the crowd glued to his lips when sitting down for a little chat and a solo encore after his band mates left the stage. All in all, the gig did certainly light up my evening, and judging by the generally content and smiling faces that poured back out into the Liverpool night, it did so for many others as well.